Sinds 1995 benoemt de afdeling wijsbegeerte van de Universiteit van Amsterdam iemand op de Spinoza Leerstoel. Een belangrijke taak van de leerstoelhouder is het geven van twee Spinoza Lezingen. 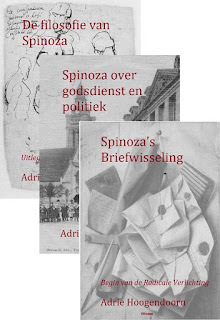 The Spinoza Lectures are given by high-profile thinkers of our time. They are intended for a wide audience that would like to keep abreast of current developments in philosophy. Dit jaar is Béatrice Longuenesse voor de Spinoza Leerstoel gevraagd. Béatrice Longuenesse is Silver Professor of Philosophy at New York University and a fellow of the American Academy of Arts and Sciences. She studied philosophy at the Ecole Normale Supérieure (Paris, France), the University of Paris-Sorbonne and, as a visiting student, Princeton University. She taught at Paris-Sorbonne, the Ecole Normale Supérieure, the University of Besançon and the University of Clermont-Ferrand before joining the philosophy department at Princeton University in 1993. She left Princeton for NYU in 2004. Ze bestudeerde en schreef vooral over Hegel en Kant. [NYU, wiki], o.a. Zij geeft de twee Spinoza Lectures op 11 mei en 9 juni 2017. Some philosophers have argued that using ‘I’ is the source of illusions, for instance the illusion that I am the author of my actions and thoughts rather than thoughts and actions happening to me, or in me. Lichtenberg maintained that “we should say ‘it thinks’ or ‘there is thinking going on’ rather than ‘I think’.” In the same vein, Nietzsche urged that “a thought comes when it wills, not when I will.” And nevertheless, using ‘I’ seems to be an indispensible tool for each individual person to refer to herself. What do our uses of ‘I’ reveal about our relations to ourselves, to others, and to the world? Aanmelden kan uiteraard niet via dit blog - klIk op de in 't blog aangeboden links.